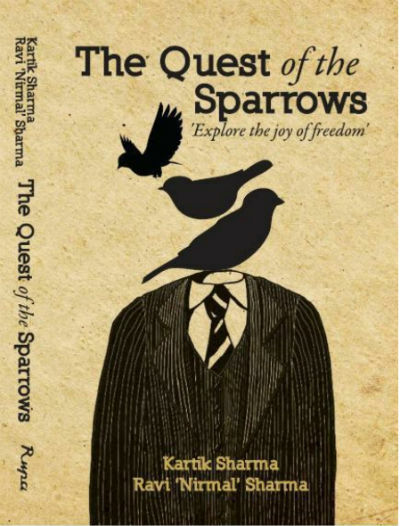 Let me share with you today my unbiased book review for The Quest of the Sparrows by Kartik and Ravi Nirmal Sharma. Impressed with some of the parts of the book DareDreamers we’ve decided to explore the authors’ work more. Fortunately, the Kindle edition of their debut book “The Quest of the Sparrows” was available in a very attractive book deal. And, we didn’t miss the chance :). Fortunately, from our team, I got a chance to read this book as well. And here are my genuine and unbiased views for The Quest of the Sparrows. How many times have you heard (or read) that One shouldn’t judge a book by its cover? Well, it is absolutely true. And, at the same time, it is in human nature (or rather, it is natural for all of the species) to get attracted towards the beauty! A large number of book read and/or book purchase decisions are influenced heavily by the impression of the cover page. The cover page of the book is simple yet effective but not very attractive. The color scheme of the cover page reminds us of a vintage or retro book. The dull background and black illustrations with the title in the same color make it look very basic in design. A headless person in a 3 piece suit with tie is the main illustration and in place of the head, you see sparrows taking off for a flight. In those terms, it tries remaining true to the book title. The book is divided into four segments. First three segments belong to the same story but they explore the story from different characters’ perspective. And the fourth one concludes the story. It starts with a man’s visit to an ashram running by one of the most famous spiritual gurus in India. The guru met with his death recently and thus, his son is now taking his place. The son – Pratibhan – is inexperienced in the field. He had never given a spiritual lecture, nor he considers himself spiritually awakened. In fact, he remained far away from his father for most of his life, so the things are odd to him. When a helpless sparrow can enjoy this world without a care, why can’t you? A group of his followers decided to join him on the quest and over the course of events we meet many characters including Nikhil, Guru Pratibhan, Sanjeev, Madhoo, A Decoit, Pathan, and others. The story is better to be explored by reading the book, rather than talking much about it. The book is a mixture of many genre and it is a good read as per my opinion. The first segment of the book is a little thrilling but more of a spiritual. It has a dose of motivational and inspirational stuff as well. And yet, the thrills also found their place inside. When it seems that the segment is going almost pre-defined path (in terms of storytelling), the second part comes as a boom. It starts with the hard-hitting thoughts of a non-believer and atheist fellow. And, I would consider it as a gem of thoughts. The majority of people are raised with the advice to not to question spiritual things and when it comes to something related to God, Dharma, religion or something similar, most of us are banned from asking questions! And, that is ridiculous. The best spiritual book in the world is “Geeta” which is nothing else but a Q/A session between Lord Krishna and Arjun. And, they were in the middle of two of the largest armies the world has ever seen. Krishna insists Arjun to ask as many questions he wants and clear all his doubts before beginning the war. Because, if you have any doubts about whatever you are doing, you cannot give it your 100% and it is true in every aspect of life. The events from the point forward are interestingly explored. Arguably we can think of a better climax for the book, but I think the mentioned one is more logical. Ever looked at the sparrows? Why is it that they always seem happy? We pride ourselves as the most intelligent species in the world, then why is happiness so difficult for us to achieve, yet so simple for them? The book has a large segment written in the past tense. Here is an interesting line is written in such a manner. It was easy to talk, but to walk the talk was the damnedest hard thing to do. Age and experience aren’t relevant. In the city, there’s no time or place for beauty… We live in concrete jails, yet imagine we’re free! City life reminds me of the merciless bullock cart driver who beats his buffaloes to hurry them up. We pity the buffaloes, but not our overburdened selves. Aren’t most of us agree with it? The following line reminded me of a wisdom tale of a serpent. Actually, there was a time when listening to a bedtime story from grandparent was in-thing for most of the children. And, if you want to go for wisdom/witty tales, some books like “Jataka Tales”, PanchTantra and others are a good choice. If you are looking for more such books, here is a good one. Being spiritual doesn’t mean one has to be indifferent. Sometimes, controlled anger is necessary to check injustice. Life has no meaning if we merely preserve it. It makes sense only if we use it. All relationships last only up to a point. Beyond that, we’re alone. How easy it is to take the masses on a roller-coaster ride, especially the believers! For me, all that these saints have managed to achieve is to start new cults and personal followings. I haven’t seen anyone transformed by listening to the sermons of these gurus in the times I live in. Human beings are constantly going towards darkness instead of enlightenment and the world is rapidly becoming a place fit only for the wealthy and the manipulative. We’ve been evolving, not into refined human beings, but manipulative, cunning and selfish beasts. Unhappy people torture both themselves and others. … the evil could tolerate indifference, but never goodness. It was impossible to provoke the icebox. The authors are impressed with the famous tale of “a hare and a tortoise”. The reference to same is also found in their second book Daredreamers: A Start-up of Superheroes by Kartik and Ravi Nirmal Sharma | Book Reviews as well. And so it does in this book too. Let’s just say that when the turtle cannot beat the rabbit, the rabbit has to be put to sleep. If are you looking for a book with a substance than this one is a good choice. There is no adult material in the book as the positive aspect (some little reference you can ignore for sure). Many of the scenes mentioned in the book will remind you of watching a movie, and that also a positive impact of the authors’ writing. The authors have explored the surrounds and background in an interesting and authentic manner. And yes, the deal with human psyche quite well. There are many incidents and scenes from the book I can refer, however, it will add spoilers and I want to avoid them as much as possible. A nice book which delves into many genres and if you can read something with an open mind this book is deifnitely a good choise.